Keep the list of Western treaters that make and supply fire retardant treated lumber and plywood handy by downloading the Sources - Fire Retardant Treated Wood. The West is home to a number of wood treating companies that produce fire retardant treated wood products. These companies offer FR lumber and plywood treated for interior and/or exterior uses in residential, multifamily and commercial construction. FR wood products are often sold directly by the treating companies, who can offer guidance on proper specification and information on the fire retardant formulations they use. Use the list below to find the producer and the type fire retardant products they produce. 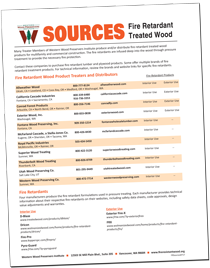 Or download listings for FR treating companies in the publication Sources - Fire Retardant Treated Wood. Four manufacturers produce the fire retardant formulations used in in pressure treating. Each manufacturer provides technical information about their respective fire retardants on their websites, including safety data sheets, code approvals, design value adjustments and warranties. Click on the links on the right to review information on each fire retardant.